Catan VR maintains the tactile, social fun of board gaming with expressive in-game avatars, crisp voice communications and two intuitive control schemes: touch controls and gaze controls. Never again will geographic distance need to break up a gaming group - with Catan VR, family and friends on opposite sides of the world can gather around the same table for a friendly round of competitive settlement. Catan VR, a new virtual reality experience which invites you to play a game of Catan on the island of Catan itself. 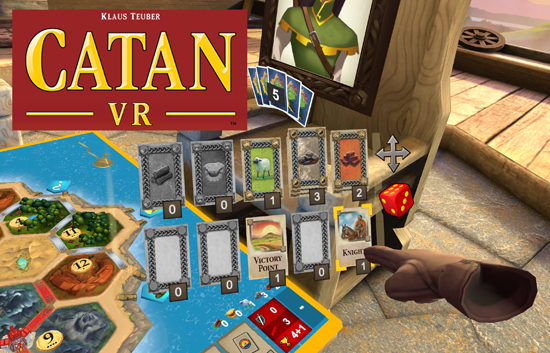 Developed in conjunction with original Catan creators, father and son Klaus and Benjamin Teuber, Catan VR elevates the title with vibrant in-game environments and cross-platform online play that bring the tabletop to life, no matter where you and your friends are. You can find Catan VR on the Oculus Store today for £10.99 €14.99 $14.99 and on Samsung Gear VR for £7.99 €9.99 $9.99. Catan VR will be available on Oculus GO soon.